This recipe for pappa al pomodoro is a great dinner idea to keep in mind during the chilly, activity-packed months ahead. Relying primarily on pantry and fridge staples — canned tomatoes, chicken stock (or vegetable for a vegetarian version) , carrots, onions, garlic, etc. — and store bought gluten-free bread, this hearty soup comes together quickly with little advance planning and has the added benefit of being chockfull of veggies! For a subtle variation, feel free to use garlic confit-infused oil wherever olive oil is called for — it’s an especially nice touch when used for the basil croutons. This soup can easily be doubled — make sure to increase the pot size as well (8- or 12-quart). Leftovers are tasty cold or reheated the next day, though the soup tends to get thicker, more stew-like the longer it sits (keep croutons separate in a zip top bag at room temp)! In a 4-quart saucepan over medium heat, warm 2 tablespoons olive oil just until it begins to smoke. Stir in onion, fennel, carrots and garlic; cook, stirring occasionally, until vegetables are softened (about 5 minutes). Stir in bread cubes and cook for 5 minutes, stirring occasionally. Reduce heat to low, deglaze pan with wine. Stir in hand-crushed tomatoes through chiffonade basil leaves. Increase heat to medium and bring to a boil. Reduce heat to a low and cook uncovered, stirring occasionally, for 45 minutes. While soup cooks, prepare croutons. Preheat oven to 350°F and line a large sheet pan with parchment paper. In a small bowl, toss bread cubes with oil until evenly coated; toss in basil leaves to coat. Arrange cubes in a single layer on prepared sheet pan, place basil leaves over top. Place in preheated oven and bake for 10 minutes, toss (don’t worry about rearranging basil leaves), and bake 5 minutes more or until cubes are golden brown and basil is crisp. Cool on pan until ready to use. Once soup has cooked, remove from heat and stir in 1/4 cup Parmesan. Season to taste with salt and pepper. 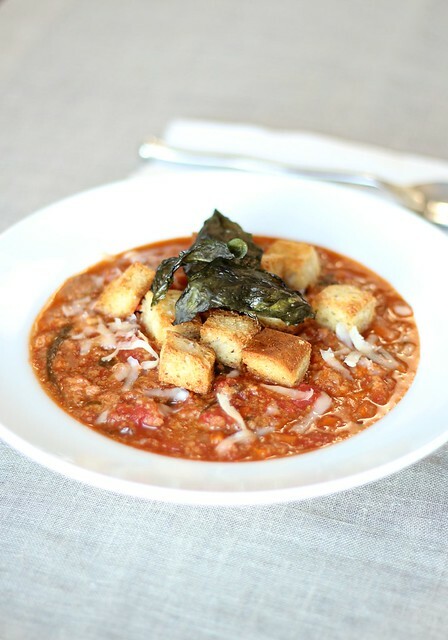 Serve soup in bowls topped with basil croutons and additional Parmesan. Copyright 2011 - 2017 - Heather Sage. All Rights Reserved.